Not a lot of matches but each gets enough time so hopefully they deliver. This is an interesting way to kick off the show. Alex Lee is everyone’s favorite Gaijin Nomad, as she opens wrestling shows for a number of wrestling promotions around Japan and is best known for her work in Stardom. Syuri is also a Freelancer, she is an MMA fighter in Pancrase but also wrestles on the side. These two have no real history but have met before here and there, why this match is on a Sendai Girls’ show I couldn’t say for sure. They start with some arm work, Syuri trips Lee and works over the ankle but Lee reverses it. They go back and forth on the mat until they end up in the ropes, Lee goes for a cross armbreaker but Syuri blocks it. Never expected to see Syuri and Lee having a mat-based battle but here we are, they finally get back up and Lee hits an armdrag before they trade trips and return to their feet. Syuri kicks Lee into the corner and then kicks her in the back, cover by Syuri but it gets two. Syuri applies a sleeper but Lee grabs the ropes to force a break, more kicks by Syuri and she applies a short armbar, but Lee rolls out of it. Jumping kick by Lee in the corner and she hits a knee followed by a double underhook suplex for two. Syuri pushes Lee off and they trade elbows, German suplex by Syuri but Lee pops up and hits a superkick. Kicks by Lee and she delivers a head kick, picking up a two count on Syuri. Lee goes for a Chokebomb but Syuri rolls out of it, knee by Lee and she covers Syuri for two. Lee slams Syuri and gets on the top turnbuckle, but Syuri avoids the diving footstomp and hits a running knee strike. High kick by Syuri and she nails the Buzzsaw Kick for the three count! Syuri is the winner. I love Syuri a lot but this just wasn’t good, which I mostly attribute to Lee. Lee’s strikes aren’t great in general but its even more noticeable when she is against Syuri, and some of the mat work was laughable. For an eight minute match it wasn’t overly eventful, with it only picking up towards the end, and at no point would I consider it exciting. Not the best use of Syuri or an ideal way to start a show. Another unique match, as Sendai Girls’ continues to give us something different. 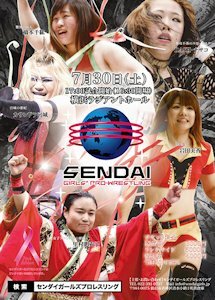 Miyagi is the only Sendai Girls’ affiliated wrestler in this match, but all the rest have been in Sendai Girls’ before. Shida usually wrestles in Pro Wrestling WAVE, where she has had title success even though she hasn’t been lucky yet in 2016. KAORU and Rose both represent Marvelous, which is Chigusa Nagayo’s promotion, with KAORU being the seasoned veteran while Rose is still a bit of an unknown wrestler from the United States. Miyagi and Rose begin for their teams, Miyagi pushes Rose into the corner and gives a clean break so she can start headbanging. That confuses the hell out of everyone as she won’t stop, Shida runs in and kicks Rose but Rose lariats both Miyagi and Shida. Vertical suplex by Rose, she picks up Miyagi and makes the tag to KAORU. KAORU works on Miyagi’s arm and puts the youngster in a stretch hold, but Miyagi gets into the ropes for a break. KAORU boots Miyagi in the corner and then applies a headlock, she puts Miyagi in the ropes and stretches her until the referee makes her stop. Miyagi hits a quick backdrop suplex, she goes out to the apron and hits a slingshot legdrop before tagging in Shida. Hip attacks by Shida, she throws KAORU in the corner but KAORU boots her back and boots her in the head. KAORU gets her table piece but Shida grabs a kendo stick and they duel with their respective weapons. KAORU hits Shida with the table, she gets on the top rope and tries to drop it onto Shida, but Shida rolls out of the way. Shida slams KAORU in front of the corner, she gets on the top with her kendo stick and tries to drop it onto KAORU, but KAORU catches it. KAORU hits Shida with the stick when she goes for a hip attack, she picks up Shida and hits a brainbuster for a two count. KAORU tags Rose, elbows by Shida and she hits an enzuigiri, she grabs the kendo stick but Rose takes it from her. Scoop slam by Rose and she hits a legdrop, picking up a two count. Shida puts Rose in the corner and then suplexes KAORU into her, she goes back to Rose and delivers a vertical suplex. Shida tags in Miyagi, dropkicks by Miyagi and she gets on the second turnbuckle, hitting a missile dropkick for a two count. Running elbow by Miyagi in the corner and she hits a face crusher, cover by Miyagi but it gets a two. Miyagi goes off the ropes but Rose catches her with a side slam, Miyagi pulls down Rose by her hair but Rose powerslams her for a two count. Rose puts Miyagi on the apron but Miyagi rams her into the turnbuckle, Miyagi goes for a missile dropkick but Rose swats her away. Rose puts Miyagi on her shoulders but Miyagi hits a DDT, Rose crawls to her corner and she tags in KAORU. KAORU hits Miyagi repeatedly with the table, suplex onto the table by KAORU but the referee won’t count the cover due to her cheating. KAORU goes up top and nails the Valkyrie Splash, cover by KAORU but Shida breaks it up. Shida hits Rose and KAORU with the kendo stick, Rose gets Miyagi on her shoulders but Miyagi headscissors out of it and sends them both tumbling over the top rope to the floor. KAORU ends up outside the ring as well, her and Rose get on the apron but Shida and Miyagi dropkick them back off. Shida and Miyagi go to do dives but are pulled out of the ring, and they battle around the floor. Rose attacks Miyagi with chairs before tying her up, she then picks up Shida and throws her at Miyagi. KAORU then returns to the ring and Miyagi is counted out! KAORU and Rose are the winners. Sareee’s trek around Joshi continues as she branches outside of Diana, as she swings by Sendai Girls’ to face off against Chisako. Chisako is one of the veterans of Sendai Girls’, where she has wrestled for the last decade. Chisako has far more experience than Sareee so it will be an upward battle for the youngster, but she has gained a lot of skill over the last year and won’t go down easy. Sareee attacks Chisako before the match officially starts with a dropkick but Chisako throws her down by the hair and boots her in the face. Dropkick by Chisako and she stomps Sareee against the ropes, she puts Sareee in a stretch hold and starts working on her arm. Chisako and KAORU attack Sareee against the ropes, hard elbow by Chisako and she dropkicks Sareee in the head for a two count. Irish whip by Chisako but Sareee hits a jumping crossbody, Chisako has none of it though and dropkicks Sareee in the knee before hitting a neckbreaker. Camel Clutch by Chisako, she picks up Sareee but Sareee blocks the face crusher. Dropkick by Chisako but Sareee returns the favor, Chisako slips out of the ring however and pulls Sareee out with her. KAORU boots Sareee at ringside, then Chisako boots her and throws Sareee into the ring post. Back in the ring, Chisako goes up top and she hits a missile dropkick. Sliding dropkick by Chisako in the corner, she picks up Sareee but Sareee elbows her and they trade shots. Chisako goes off the ropes but Sareee rolls her to the mat and hits a footstomp. Sareee goes up top and hits the missile dropkick, she goes up top again and she hits a second one for a two count. Chisako snaps off a German suplex, she picks up Sareee but Sareee slips around her and hits her own German suplex for a two count. DDT by Chisako, they go back and forth with elbows until Sareee hits a dropkick. Sareee goes up top but Chisako gets a chair and throws it at Sareee’s head. Chisako then joins Sareee and hits a superplex for a two count cover. Chisako goes up top but Sareee hits her feet up on the Hormone Splash attempt, slaps by Sareee and she dropkicks Chisako for two. Sareee goes for the Uranage but Chisako blocks it and hits a Stunner, Northern Lights Suplex by Chisako and she rolls through it to hit a follow up vertical suplex. Chisako goes up top and nails a diving footstomp, Hormone Splash by Sareee and she gets the three count! DASH Chisako is the winner. I had higher expectations for this match but it was still fine. Sareee looked like fire in the Catch the WAVE Tournament earlier this year so I was hoping it elevated her status a bit across the scene, but Chisako didn’t have any major issues with her as Sareee only hit a couple big moves in the entire match. It felt like a midcard house show match, with two skilled wrestlers able to put on a good match in their sleep but not doing a lot to elevate it beyond that. I liked Sareee’s energy and Chisako is so on point with all of her offense, it was an easy watch, it just didn’t go to the next level. Poor Sendai Girls’ babies. Hashimoto and Iwata both debuted for Sendai Girls’ last fall and have shown a lot of potential since then, going toe to toe with big wrestlers from multiple promotions. But here they face off with two of the deadliest Joshi Freelancers in Aja Kong and Kyoko Kimura, who are likely here to show the rookies they still have a ways to go to reach them in the pecking order. Kimura and Hashimoto start off for their teams, Kimura pushes Hashimoto into the ropes and chops her before backing off. Kimura tags in Kong, Kong keeps Hashimoto at bay at first but Hashimoto eventually gets Kong to the mat. Kong and Hashimoto struggle for position on the mat but they end up in the ropes and are forced to break. Hashimoto hits a fireman’s carry but Kong lands in the ropes, so Hashimoto tags in Iwata. Kong punches Iwata in the face and tags in Kimura, Kimura throws down Iwata by her hair before hitting a scoop slam for a two count. Crab hold by Kimura and she then applies a facelock, but Iwata gets to the ropes for a break. Kimura tags Kong back in, Kong slams Iwata and she hits an elbow drop for two. 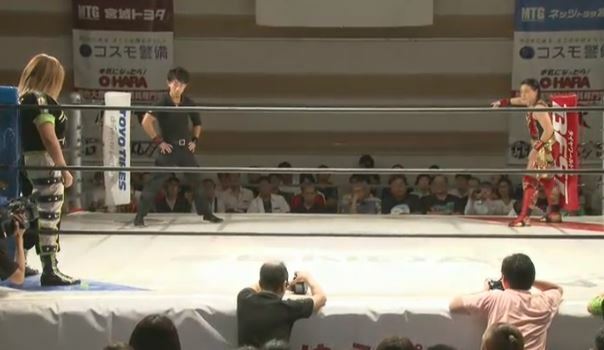 Kimura returns but Iwata hits a bodyscissors, she tries to tag in Hashimoto but Kimura cuts her off. Kimura and Hashimoto trade elbows which gives Iwata time to recover, but Kimura tosses Iwata to the mat. Iwata elbows Kimura but Kimura hits a lariat, Irish whip by Kimura but Iwata dropkicks her. Iwata makes the hot tag to Hashimoto, shoulderblock by Hashimoto but Kong runs in and hits Hashimoto. Hashimoto stacks Kong and Kimura in the corner and hits a body avalanche, hip attack to Kimura and Hashimoto covers her for a two count. Hashimoto slams Kimura and hits a somersault senton, Hashimoto picks up Kimura but Kimura applies a Cobra Twist. Iwata runs in but Kimura puts her in a submission hold too, Kimura boots Hashimoto repeatedly in the face before covering her for two. Kimura tags in Kong, Irish whip by Kong to Hashimoto and she hits a lariat. Hashimoto manages to slam Kong and hits a hip attack, but Kong kicks her when she goes for another one. Spear by Hashimoto and she tags in Iwata, kicks by Iwata but Kong shrugs them off and floors Iwata. Enzuigiri by Iwata, Hashimoto comes in and they double team Kong. Diving body press by Iwata, but Kimura breaks up the cover. Hashimoto shoulderblocks Kimura, they throw Kong to the corner but Kong lariats both of them. Kong picks up Iwata and hits a German suplex, she picks up Iwata and she nails the brainbuster for the three count! Kyoko Kimura and Aja Kong win! Like the last match I was hoping the vets would be a little more giving as the bulk of the match was Kimura and Kong easily handling their business. Hashimoto and Iwata did get in some offense towards the end so it wasn’t a squash, but at no point whatsoever did it feel like they had any chance of winning. At least Kong has a great brainbuster, which always makes things a bit better. Not a bad match, just a bit lackluster as it lacked much excitement. After an eight month buildup, Meiko Satomura finally gets Yoshiko one on one. The ‘feud’ started when Yoshiko returned to SEAdLINNNG, and Satomura was one of the few that showed some displeasure in Yoshiko returning to wrestling so soon. We will never know if that was a legit feeling or just the start of a storyline, but by the spring, SEAdLINNNG and Sendai Girls’ were having matches against each other. On July 11th in SEAdLINNNG they were on opposite tag teams, where Takahashi pinned Satomura in the main event. 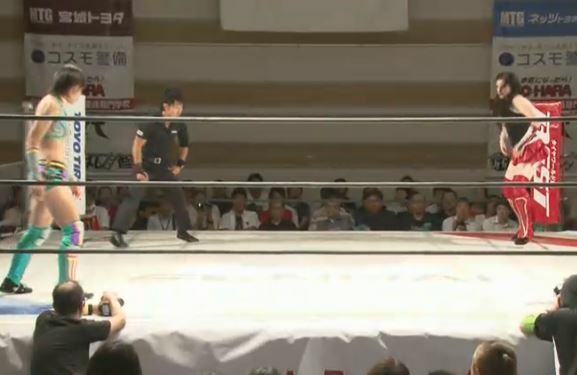 But that was just setting up this, a singles match between the Sendai Girls’ ace and the 2nd in command in SEAdLINNNG. Yoshiko and Satomura start trading wristlocks, Satomura gets Yoshiko to the mat but Yoshiko gets her foot on the ropes. Satomura goes for the cross armbreaker but Yoshiko blocks it, Satomura manages to get an elbow lock applied but again Yoshiko forces the break. Kicks by Satomura as she knocks Yoshiko into the corner, Satomura applies a stretch hold before applying a headscissors. Yoshiko gets out of it and headbutts Satomura, kick to the head by Yoshiko and she hits a series of running sentons for two. Satomura rolls out to the apron and Yoshiko applies a sleeper from inside the ring, Yoshiko pulls Satomura back into the ring and hits a facewash in the corner. Jumping lariat off the second turnbuckle by Yoshiko, she picks up Satomura and she hits a lariat. More facewashes by Yoshiko, she goes off the ropes but Satomura nails a high kick. Kicks to the chest and arm by Satomura but Yoshiko catches one and clubs her in the head. Jumping heel kick by Satomura, she picks up Yoshiko and hits another high kick. More kicks by Satomura and she hits an uppercut but Yoshiko recovers and hits a Samoan Drop. Satomura quickly jumps up and applies a Sleeper, but Yoshiko gets a foot on the ropes. DDT by Satomura and she hits a cartwheel kneedrop, cover by Satomura but Yoshiko kicks out. Satomura goes up top but Yoshiko recovers and throws her off. Lariat by Yoshiko and she hits another one, cover by Yoshiko but it gets two. Yoshiko blocks a Satomura high kick and lariats Satomura in the back of the head, Yoshiko applies a sleeper but Satomura gets out of it. Spinebuster by Yoshiko, she goes up to the second turnbuckle and hits a diving senton before flipping off Satomura. She goes up again and hits a second one, but Satomura gets a shoulder up. Yoshiko goes all the way up this time but Satomura nails a Pele Kick, Satomura picks up Yoshiko but Yoshiko hits a Code Breaker. Satomura kicks Yoshiko in the chest and hits the Death Valley Bomb, Satomura gets the sleeper applied in the middle of the ring and Yoshiko goes to sleep! The referee calls for the bell, declaring Meiko Satomura the winner. Top to bottom I thought this was a pretty disappointing card. Aside from the main event this basically was a house show and they wrestled like it, there were a lot of great wrestlers on this show but the matches were so forgettable. There were a few moments that stick in the brain, like Miyagi being Miyagi, but everything else just blurred into one big pile of Meh. Chisako vs. Sareee was particularly disappointing as both are so good but they wrestled a basic match. The main event was great, they brought all the emotion that had been missing up to that point, but it wasn’t enough to save the card. Watch Satomura vs. Yoshiko but skip the rest.